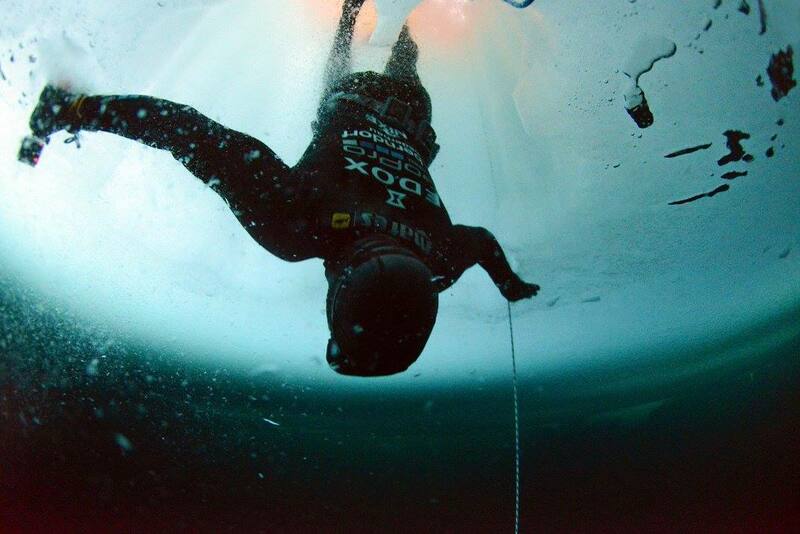 On April 14th, world champion free diver Christian Redl – and Edox ambassador – completed the first ever free-dive (without breathing gear) at the North Pole. In March, Redl explained to PROFESSIONAL WATCHES that the main purpose of his upcoming North Pole expedition and dive was to raise awareness about global warming, and how it causes the Polar ice to melt away each year, which affects the habitat of Polar bears, making it harder for them to survive. Polar bears are not an endangered species, but they are classified as “vulnerable” right now and it will only get worse if something is not done to affect the climate change. While the South Pole lies on a land mass, the North Pole is located in the middle of the Arctic Ocean. The water there is almost permanently covered with sea ice that is constantly shifting. And it’s this dynamic, specifically the fact that the ice is moving in all directions, that makes the Arctic waters at the North Pole treacherous to dive in, not to mention the ice cold water. Redl has been free diving since 1996, and is considered one of the world’s best free divers under ice, backed up by the fact that he currently holds two world records for free diving under ice: 90 meters with fins and 150 meters aided by a scooter. In addition to his ice free dive records, he was also holds a record for to diving through a 101 meter long cave, and for a free dive to the bottom of a 60 meter deep cave, only with fins. Read more about his achievements HERE. His ability to survive icy conditions in and out of the water has earned him the nickname “The Iceman.” And now he can say he survived a 30 meter dive in the icy waters at the North Pole, making his name even more fitting. The expedition leading up to his free dive consisted of Christian Redl, and Australian photographer, Marcus Fillinger, as well as a support team. They first traveled from Canada to their base camp at the North Pole. The expedition, across the Arctic ice, required Redl and Fillinger to venture out from the base camp to setup a spot to complete the dive. To do so, they used Siberian huskies that walk ahead of them, because the dogs can detect thin ice using their sense of smell, effectively steering them away from dangerously thin ice that they could fall into. There is also threat of Polar bears, and so they carried a 44 magnum just in case they needed to fend them off, however, considering one of the main goals of the expedition was to raise awareness and ultimately help protect Polar bears, avoiding them was the plan. Once they reached an ideal dive spot (if there is such a thing at the Nort Pole), they had to test the water using a rope to determine if the current was too strong. For instance, if the rope goes under the ice, it is unsafe to dive as once you go down, you would likely not be able to find the opening to come out at. The day of the dive, the temperatures were -2 degrees in the water, and -30 degrees out of the water. At that temperature water will freeze in about a minute (making the MasterLock crown protection system which prevents the crown from freezing, quite useful). Needless to say, freezing was a serious concern. After being in the water for over 15 minutes, both Redl and Fillinger needed to quickly get their body temperatures up, and into warm, dry clothes, and then make a trek, with the dogs, to a nearby helicopter. Then into heated tents at the base camp, to fully recover from the extreme cold/wet conditions. 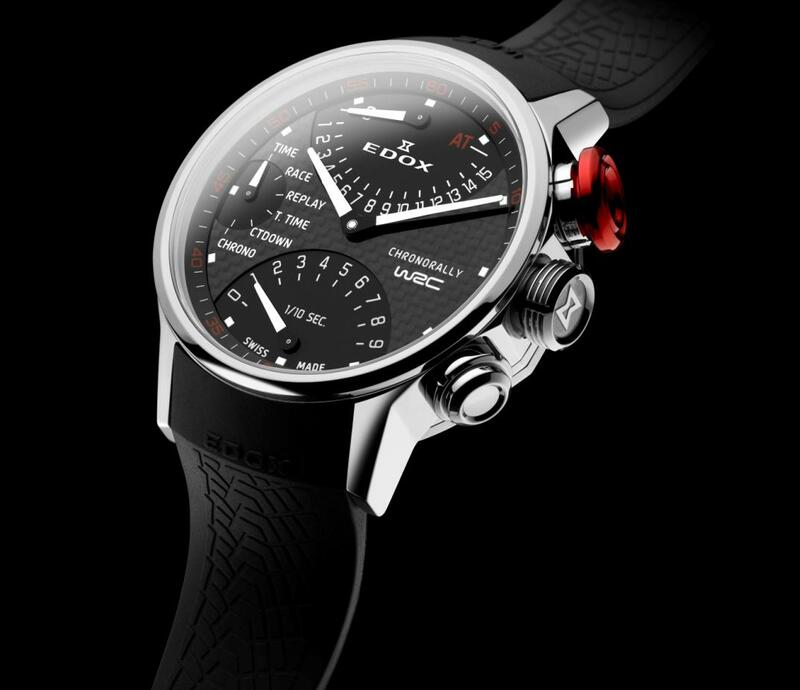 The watch that Redl wore on one wrist (in addition to dive computer on the other wrist) was the Edox Hydro-Sub 50th Anniversary LE. 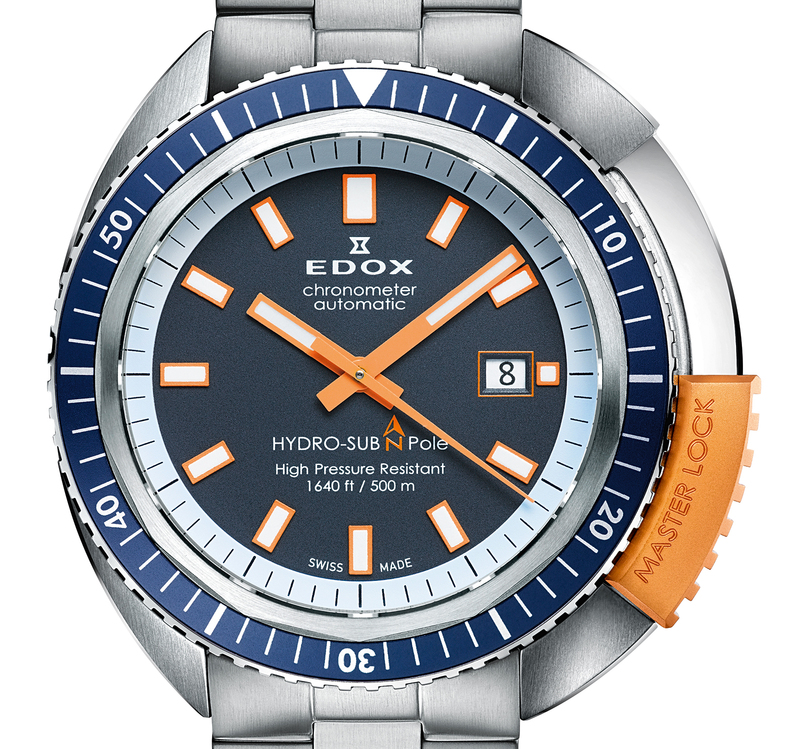 Like the Hydro-Sub shown (at top), the case is steel and measures 46 mm in diameter, however, there are a number of small difference (the standard model features an orange and blue color scheme versus blue and lime green on the limited model). The LE version comes with a special blue dial, white applied hour markers and a lime green second hand. Powering the watch is a Sellita SW-200 automatic mechanical movement, which beats at 4Hz, has 26 jewels and a power reserve of 38-hours (comparable to an ETA 2824-2). The bezel is made from steel and aluminum and rotates unidirectionally to mark dive times. The MasterLock, is a key feature designed to protect the crown from damage using a mechanism on the bezel at 2 o’clock that can be slid across to protect the crown. It is blue with the word “Master Lock” engraved in lime green. (A double o-ring gasket also ensures the crown is water-tight). Water-resistance is 500 meters. Each watch comes with a stainless steel bracelet and a black rubber strap. The Hydro-Sub Limited Edition is presented in a special box which includes a tool to switch between the strap or bracelet. 515 pieces are available, each is numbered along with a North Pole engraving on the solid steel caseback. The retail is $2,395. After the dive, we heard back from Redl and he informed us that he ended up completing several dives, the deepest being 30 meters, as planned! The temperature that day was about -2 degrees in the water and -30 outside, so everything froze quickly. Even traveling back to the base camp, the Edox watch proved very useful, as magnetic compasses don’t work at the North Pole, and GPS devices are unreliable. According to Redl, an analog watch is needed as a backup for a compass (as explained here). Doing a 100 foot deep free dive (with no oxygen tank), in below freezing water, under constantly shifting Arctic ice – not only tests the boundaries of human endurance, but also of all the essential tools, such as the dive watch. The kind of test where the only grades are “pass” or “fail” – no in between. Thankfully, both Redl and the Hydro-Sub passed with flying colors.